Have a few favorite Instagram filters that you want easy access to? Never use some of the other filters and you want to hide them? You can now do both, rearrange your photo filters so that your preferred choices are in whatever order you’d like, and you can hide the filters you don’t like or don’t use. Of course if you hide a filter or many and decide you want to access them again, you can do that too. 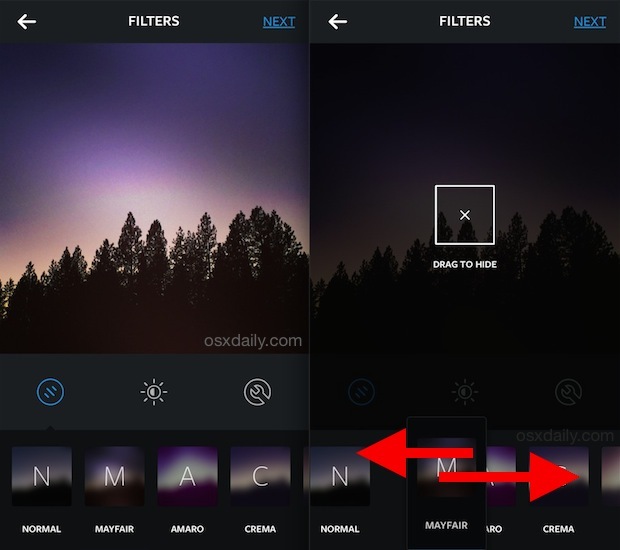 There are two ways to change your filters list, one uses a simple drag trick similar to changing home screen icon layouts, and the other uses the Instagram apps filter management tool. Moving around or hiding the filters requires the latest version of the Instagram app, so be sure you update in the App Store if you haven’t done so yet. For what it’s worth, this works the same on the iPhone Instagram app, and the Android Instagram app too. Oh and if you’re going to be messing around with your filters like this, you may want to take a moment to flip into Airplane mode so that you don’t accidentally upload a picture while you’re making adjustments. Just tap and hold on an Instagram filter until the image dims, then drag the filter left or right to arrange it into the position you’d like to keep it at. If you want to rearrange all your filters in a somewhat easier manner, use the Manage tool, accessible by swiping all the way to the right of the filter list. 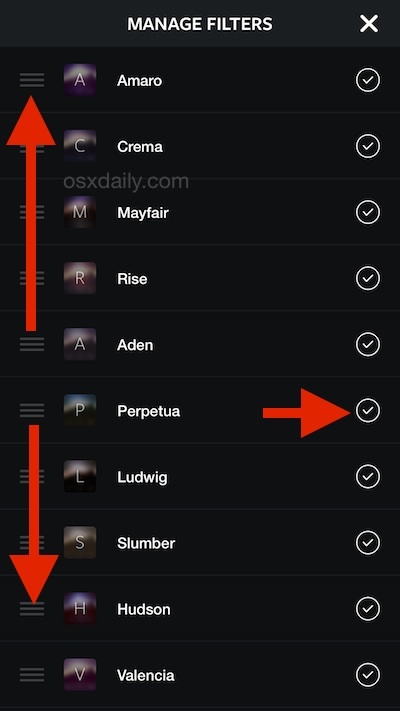 Dragging filters around the list is done the same way you would with other list items in iOS, arrange them so that your favorites are near the top of the list and they will appear in the front of the filter slide bar. 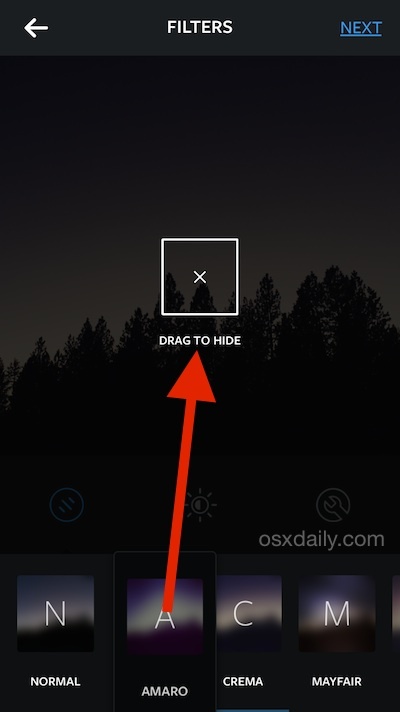 Hiding a filter is just as easy as rearranging, tap and hold on a filter, then drag it into the large “Hide” section that overlays your image. You can also hide filters through the Manage option, accessible through the far right side of the filter list. If a check is not shown alongside the filter name, the filter will be hidden. Want to regain access to your filters? You’ll need to use the “Manage” tool, accessible by scrolling all the way to the far right-side of Instagram filters and tapping on “Manage”. To show a filter you have hidden, tap on the filter so that a check appears alongside the name. After you’ve perfected your filters and IG photos, don’t forget that you can turn your own feed or someone elses into a custom Instagram screen saver or even a wallpaper, both of which are pretty neat ways to view a favorite Instagram feed or set of photos on a Mac.